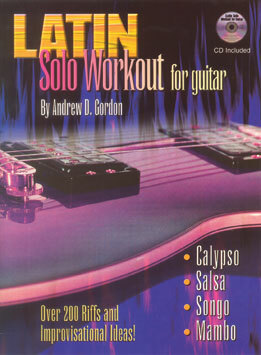 This book gives guitarists the opportunity to practice improvisational techniques while playing along to rhythm tracks of keyboards, guitar, bass, drums in various different Latin styles including Calypso, Mambo, Salsa and Songo. There are 20 different “grooves”: 1 Calypso, 8 Mambo, 6 Salsa and 5 Songo. Grooves consist of a variety of tempos and keys. The first part of each section consists of the chord progression for each groove that repeats for the length of the song. Includes play-along CD.